I've been working, travelling, and expanding my household by adding a 19-year-old niece (what a long story!). The sewing has come in fits and spurts. I got the idea for a coat/ dress after watching Signe Chanel this summer. Each Chanel seamstress enters the atelier in the morning, leaves her jacket in her locker, and puts on a simple white work coat. Like a lab coat, in a way. The idea of putting on a coat to signal that it's time to get to work has a lot of appeal, so I decided to sketch out a couple of "lab coats". This is the first of two in my head and on paper. I started collecting black denim this summer, knowing that white simply wouldn't work for me. I started the pattern on October 8. I remember because Louis had a playground accident that morning, and I had to stop working on the pattern to pick him up from school and take him to the emergency room. He got all stitched up and back on his feet quickly, but everything on my cutting table stayed where it was for a full week! The next time I got back to the pattern, I had a couple of days to finish pattern work and cut out and assemble the main pieces: jacket front and back, front and back yokes, front zipper. It hung on Clementine for about 3 weeks until I could work on it again. In one short session I draped the collar and sewed it on, and in a subsequent session I finished the insides (yoke facings) and cut the sleeves from the bottom legs of another pair of jeans and attached them. Today I washed it and put on the 1/4" brass studs. I wanted to only put them on one side of the collar, my 6-year-old said I should do it on both sides, and I intended to... until my fingertips protested after I finished the left side. So asymmetrical it is! Although I always envisioned it with sleeves, it looked much more like what I had in mind without the sleeves! My niece convinced me to try the sleeves so I did, and after trying it on with sleeves I really kind of hated it. Not so much for what it was, but for how far it seemed from what I had in mind. Now that I've washed it, taken photos, and see those photos, I am good with it! This is the second piece of Vocabulary's imaginary fall collection, with the studded capelet being the first. The collar was everything! The entire concept came to life because of my idea for the collar. After I attached the collar, I tried the coat (sans sleeves) on and my husband said, "I really don't care for it." I asked what he didn't like, and he was unable to articulate anything specific. At which point I went totally "Project Runway contestant" on him and declared, "Well, I like it and will wear it to your office Christmas party next month." Unlike PR contestants, I spun around and walked out of the room. He followed me in there a few minutes later, possibly thinking he'd hurt my feelings, though still unable to tell me just what didn't work for him. I remained neither angry nor offended. It was just clear to me that he didn't get it. His tastes run pretty traditional/ conservative. With 3 years of garment sewing and 2 years of pattern play under my belt, my ability to create is catching up with my ability to imagine. And I find it hard to compromise now. Well I love it! Especially the collar. I think you should wear it to the Xmas party! It is quite an edgy design, maybe that's why the hubby was somewhat puzzled in his opinion. I love it, especially the shiny silver zipper - it really stands out in the pics along with the studs - and the whole styling you did with the booties and the socks. You're channeling the whole edgy thing! However, I must say, it may not be the best garment to sport at a Christmas party. Too minimal, not "festive" enough, or just the fabric being denim, I really can't put my finger down to it, but it simply doesn't spell "party" to me. Perfect for virtually anything else! 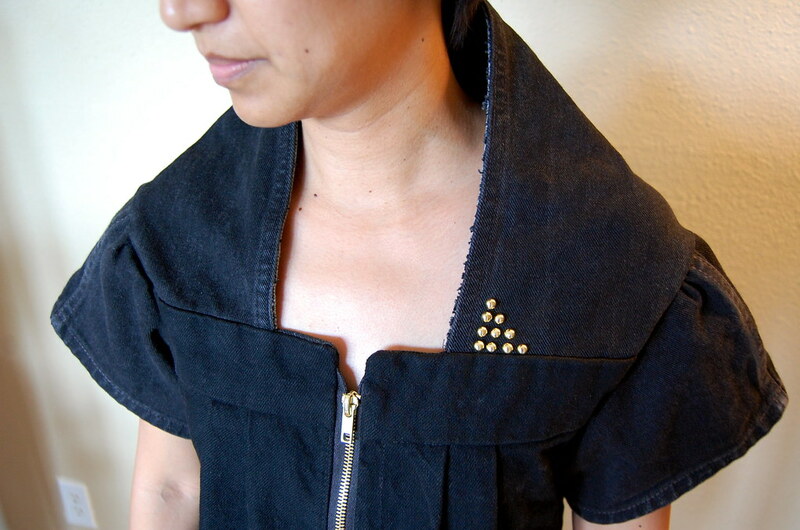 While black denim may not work for the office party, I can totally see this in a silk dupioni with rhinestone accents. I remember seeing a zipper with Swarovski crystal teeth and zipper pull. I. LOVE. THIS. It's been forever since I sewed anything...you're inspiring me to change that! After some more gawking, I have decided that if you are ever in Boston for work, we MUST meet up and I'll be hoping that you rock this look with tights/boots/scarf/long sleeve tee/etc. as works for you, and I will be so, so proud to walk down the street with you!!! You look great! It really suits you. It's really all about finding your look and wearing it with confidence. It's great that you wear clothes that reflect your imagination, creativity and ethical viewpoint - they really say so much about who you are - and you can't ask for better than that. ps still getting lots of errors opening your web page but at least this time my computer let me leave a comment! Cute! I love the collar and the asymmetrical studs! it really is about the collar! and that's why i love it! fantastic job! It's probably a little too gothic for a work Christmas do, but would give you many coolness points at any art gallery opening. Seeing this almost made me go "why do I even bother? ", but it also inspires me to keep trying. I like how your imagining-drawing-making brain works. And I love the collar. The whole thing is just nifty. Wow! This looks fantastic -- I love it! I think it's fun! Definitely not the run-of-the-mill type stuff you'd find at the average store, but that's what's great about it. And I love that you made it out of old jeans. I love your totally unique fashion attitude. Walk past the Satorialist's camera - you exemplify NY street style. That's such a cool idea to have a "lab coat"! Lab coats are a nice variation on a uniform because you can still wear individualized clothing underneath. Or, of course, you can make your lab coat fashion in and of itself, like you have! looks very edgy and project runway worthy!!! I totally get it. I love the coat. It's a great way to recycle denim. I am just in awe of you. Really. You have to feel proud! Antoinette - the coat dress is fabulous! I love it, especially the collar. love that collar! super awesome job, as usual. This coat is totally awesome in every way. I too love the concept of a work uniform, and this looks both very modern and wearable.